Lock in a great price for Willa Maja – rated 8.5 by recent guests! Bardzo smaczne i urozmaicone śniadania. Przemiła i bardzo pomocna właścicielka. Lodówka w pokoju. Cicha i spokojna okolica a jednocześnie blisko do centrum. Śniadania przeciętne, codziennie to samo, jak by nawet z kilku dni. No i szklanki i sztućce nieczyste (trzeba doszukiwać tych czyściejszych). Miły personel. Pani właścicielka jest wspaniała osoba i czarodziejka 😊 Wspaniały pobyt! Przemiła właścicielka.. Pyszne śniadanka.. Czyściutko.. Wszędzie blisko.. Atmosfera bajka ❤️❤️❤️ Naprawdę polecam pobyt w Willi Maja..
Patiko suo vardu Tolikas ,Vila arti judesio. Leido isvykti veliau nei planavome. Paklausus ar kalba angliskai atsakyma gavome Now !!! Puiki vieta svarus ir tvarkingi kambariai , Aciu!!! Bardzo dobre i urozmaicone śniadania, co dzień coś innego na ciepło. Miła właścicielka, czysto i schludnie w pokoju i ogólnie w całym obiekcie. Jedyne czego brakowało nam podczas pobytu to jakieś atrakcje dla dziecka typu huśtawka, zjeżdżalnia itp. Generalnie polecamy! Czysto, miła obsługa, śniadania przeciętne, przydałby się jakiś sok, i urozmaicone sałatki, bardzo mała łazienka, ale ogólnie pozytywnie oceniam. Wie auf den Bildern zu sehen ist das Frühsztück sehr vielseitig. Ja es werden keine Brötchen beim Frühstück serviert, aber verschiedene Sorten an frischem Brot. Es werden täglich abwechselnde Salate auf Basis von Fisch, Fleisch, oder Ei serviert. Die Zimmer sind sauber und auch die Betten normal hoch. Die ruhige Lage der Unterkunft hat uns sehr gut gefallen. 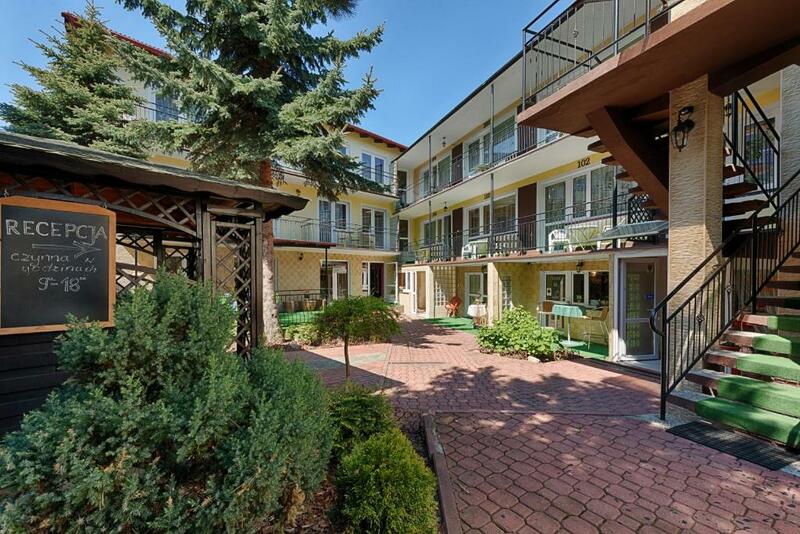 Located in the seaside resort of Jastrzębia Góra, within walking distance of the beach, Willa Maja features comfortable accommodations and a spa center. Wi-Fi is free in public areas. The rooms at Willa Maja come with tea and coffee facilities, a TV and a balcony. You can also use the beach equipment provided, including a beach blanket and a windbreak. The property has a spa, where you can enjoy a range of treatments. You can also use the hotel’s sauna. In the dining room with a fireplace, you can enjoy breakfast buffet and dinner. In the summer coffee and tea are served on the terrace. When would you like to stay at Willa Maja? A smaller room with a flat-screen TV, a fridged and a balcony. It has a bathroom with a shower. A room featuring a folded armchair. It comes with a flat-screen TV, a fridge and a balcony. Bathroom comes with a shower. 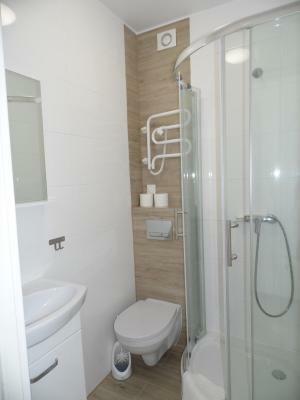 A ground floor room with a patio exit, a kitchenette and a bathroom arranged for disabled guests. A room with connectable beds, a bathroom with a shower and a kitchenette with a fridge, an electric kettle and a terrace exit. A studio with a living room and a bedroom, as well as a kitchenette and a bathroom with a window. This triple studio consists of two rooms: one with a sofa bed or a single bed and the other with a double bed. This small single room has a bathroom, a TV and a fridge. House Rules Willa Maja takes special requests – add in the next step! A deposit via bank transfer is required to secure your reservation. Willa Spa Maja will contact you with instructions after booking.